Above: I'd even go so far as to say this game looks better in stills. My review of Limbo is up now at thephoenix.com. I promise you that it is not intended as kneejerk contrarianism. The tone of this review is partly a reaction to the praise, yes, but I'll defend the substance of the criticisms any time. I'm not discounting the validity of the profound experiences so many other people are claiming to have had with this game, but, wow, I didn't see it at all. 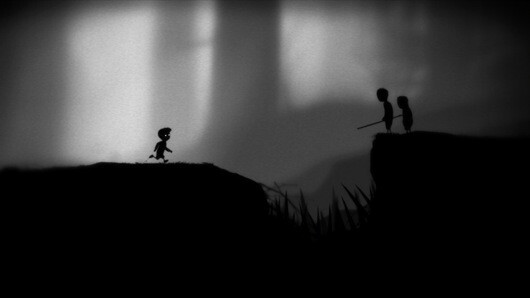 As for whether Limbo is the long-awaited proof that games are art, well. We can agree that it sure looks neat. And we can probably agree that the big spider is pretty scary. Beyond that? I'm not buying it. The closest this game gets to something resembling truth and not artifice is the occasional appearance of larger boys who ambush your character and then scurry away. This is interesting, and feels unforced, especially compared to the rest of the game. As with everything else, Limbo passes over this tantalizing opportunity. The boys come and go, and nothing much happens. Meanwhile, the game moves onto much less evocative threats, like buzzsaws and electrified rails. (Yes, those certainly speak to the essence of your childhood fears.) Doesn't that all seem backward? The big spider comes first. Then the creepy bullies. Then a bunch of clanking machinery with no character at all. Talk about diminishing returns. If there had been another level, our hero would be trying to avoid eating his beets. Limbo just seemed so desperate to convince me of its profundity. I wanted to put my arm around its shoulder and say: You've got a lot of growing up to do, kid.